In a white dress, white gloves and a pillbox hat, the old woman held tightly to the worn and tattered manuscript of her dead son. She waited patiently outside Walker Percy’s office at Loyola University in New Orleans. He was her final attempt to secure publication of her son’s novel. The last thing Percy wanted was a manuscript from an unpublished dead writer. But whether out of pity or an attempt to end the conversation with the unusual woman who rolled her Rs like a Shakespearean actor, he took the manuscript from her and, agreeing to read it, ferried it across Lake Pontchartrain to his home in Covington. Most people are unaware of the lengths Percy went to get A Confederacy of Dunces published. Having struggled with depression, Percy felt the weight of John Kennedy Toole’s suicide. From the moment he read the first page he bore the burden of the manuscript as if it was his own. It had been rejected by the top publishers in New York. And it had languished in a box atop a cedar armoire for years after Toole’s death. But Percy was compelled to find redemption for the author. He also believed it was a great novel. Mary Pratt Percy, David DuBos and me outside St. John’s Coffeehouse in Covington. A few weeks ago I returned to Covington with filmmaker David DuBos, who is adapting Butterfly in the Typewriter, to visit with Walker Percy’s daughter and, hopefully, visit his home. 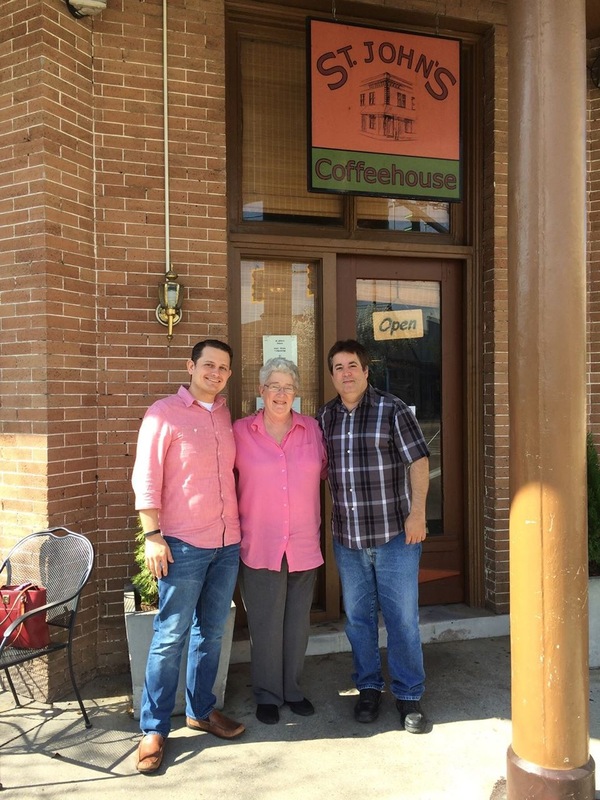 We met Mary Pratt in St. John’s Coffeehouse in downtown Covington, a cozy spot she refers to as her office. It was a warm reunion for me. The last time I met with her was when I interviewed Walker’s wife, Bunt, in 2010. A few months after Butterfly was published Bunt passed away. Since then, Mary Pratt had read David’s script and was excited about the movie and thrilled at the cast David was building. She pointed us in the direction of her parents’ houses, two of them, right next to each other, about a mile from the coffeehouse. 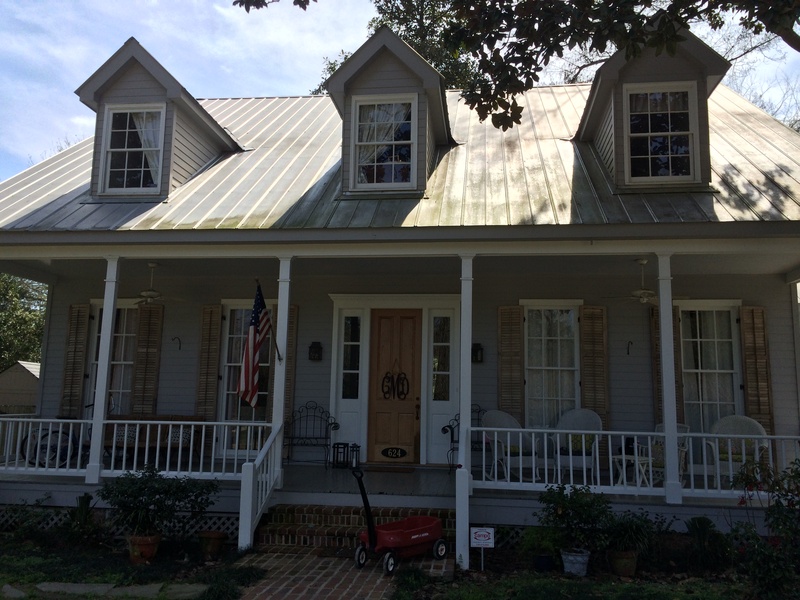 Down a gravel road, the large brick home stood like a French Chateau and next to it a lovely, but much smaller A-frame house with large dormer windows, like a creole cottage. Wanting to downsize, Walker built the smaller home in the early 1980s and told his wife it would make tending house easier. Bunt said that promise never came true. It is quiet here, serene, perfect for a writer. Unlike the homes of Flannery O’Connor, Tennessee Williams and Ernest Hemingway, there is no museum with tour guides, no gift shops selling refrigerator magnets and shot glasses. Today, Walker’s daughter, his grandson and family live in the homes. So it was a rare treat to be invited into his sanctuary, where he had crafted his novels and where he first read of Ignatius Reilly. With a warm welcome, his grandson, David and wife, Celeste, opened the door and showed us to the back room where large sash windows look out over the Bogue Falaya River. Lush green vegetation lines the dark river and the occasional river boat passes by. It was one of those views that make cities seem absurd. One could stay here forever. It was easy to imagine Percy drafting The Moviegoer or The Thanatos Syndrome while looking out these windows. But like most writers he was susceptible to distractions. A bird singing in the evening light or a squirrel scampering up a tree–anything to avoid actually writing. His grandson showed us to where Percy kept his office with a desk and a couch; he had to face the driveway to get work done. There he composed his novels. When he came home that night after meeting Thelma Toole for the first time, he plopped the manuscript onto the kitchen counter and asked his wife to read it. She did. She loved it and a few days later simply said, “It’s ready for you.” Now he couldn’t get out of reading, at least, the first page. Walker enjoyed relaxing on this patio he built with his children. Percy enjoyed sitting out on the stone patio he built with his daughters, eating sandwiches and watching the river life. It’s possible he first met Ignatius Reilly there under the towering cypress trees. While Percy hoped he would hate the novel, he found, page after page, he could not put it down. And Toole had finally found the champion he needed. Ignatius Reilly feared the chaos that surely awaited him outside the bounds of New Orleans, but in the end his creator escaped the city and the demons within it. He was found dead under the swaying trees off the gulf coast of Mississippi. 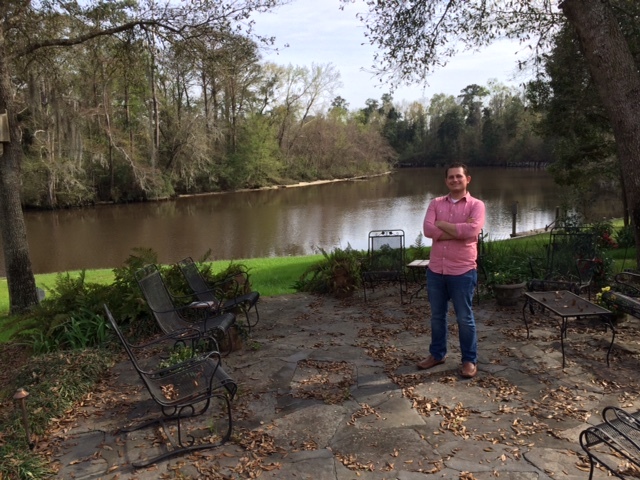 And his novel escaped the city as well, taking first root along the shores of the Bogue Falaya River in the hands of Walker Percy. Much like Percy, I find something spiritual about Covington and the Northshore. The way the moon dances off the lake, the way the pelicans glide along the water, and how the Spanish moss delicately hangs from the canopy of trees. This is a place of contemplation, where even the water deep below is remarkably pure. 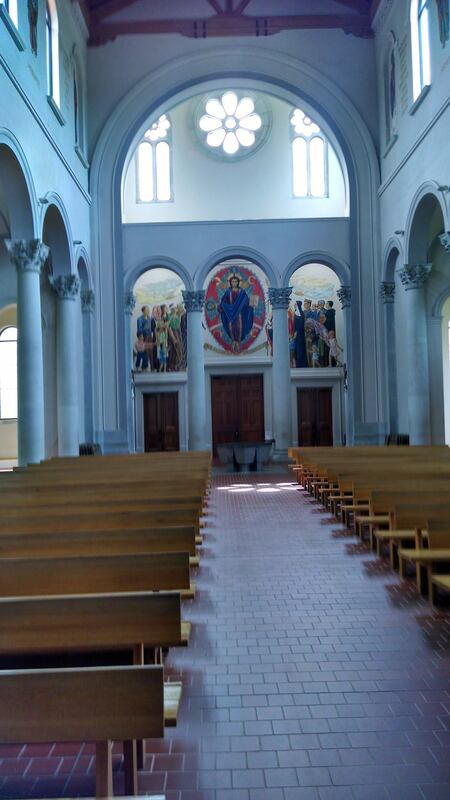 Later in the day, David and I went to St. Joseph’s Abbey, where Percy went to mass and often came for spiritual guidance. As we walked through the church doors incense still hung in the air and an organist played Bach, practicing for a concert later that afternoon. We walked back to the cemetery. Bunt Percy’s tombstone was adorned with a vase of flowers, the stone clean and crisp looking. I had only met her once, but the afternoon I spent with her casually discussing their visits with Eudora Welty and Flannery O’Connor remain a highlight of my life. I was pleased to learn she had received a copy of my book before her passing. Next to her lay Walker Percy. Camellia blossoms at the four corners of his footstone. As I worked on my book, I had so intently focused on understanding Toole that I never fully appreciated how tirelessly Percy worked to bring A Confederacy of Dunces to the world, even as he worked on his own novels. It was beyond selfless and, honestly, a rare deed among writers. For him, the novel had become a kind of ministry– a final rite that he could offer a man to whom he felt a deep connection. Thelma Toole was right when she called Walker Percy a knight in shining armor and a guardian angel. What I most respect is the quiet method he went about helping Toole. Without seeking glory, he offered redemption to a fellow sufferer. Thank you, Dr. Percy. I don’t know how I missed out on the info about a movie being made, but suffice to say I’m really excited about this. I was a student at Loyola while Percy was author-in-residence (or whatever they called it) and remember all the brouhaha about Thelma and the novel. When I read your book, I realized that JKT grew up literally blocks from my grandmother’s house in uptown N.O. No doubt I had uncles and cousins at Fortier with him during that time. I hope you got to visit there while you were in town. The school is now Lusher but is still physically very much Fortier. I guess you know that the St. Tammany Parish Public Library (main branch) in Covington is named for Walker Percy. My cousin is on the staff there. I live in Slidell, and would have loved to meet you when you were on the north shore of Lake Pontchartrain. Thank you so much for what you have done with this story. Since Katrina, New Orleans has become home to countless transplants, now more than ever. When an opportunity to discuss “Confederacy” presents itself in conversation, I’m appalled at how many know nothing of it. Even locals. The story though tragic is rich, and your book has done it immeasurable justice. It is an exciting prospect, Margaret. Looks like you were at ground zero for this event. Were you in Percy’s class when he read the first chapter aloud? I did visit Fortier (Lusher) when researching the book. The librarian opened up the “archives” for me, which was a couple dusty boxes full of old yearbooks and school newspapers. That is where I found Toole’s first satirical writings. I hope Lusher decides to donate those in some form to the Toole Papers at Tulane, instead of keeping them in a storage room. I should have updated my events page before coming into town. The Baton Rouge event happened so quickly. Next time I am there (I usually stay with Joe Sanford of Pelican Pictures in Covington) I’ll let you know. Maybe we can get together for coffee. Happy to hear your are spreading the word of this story. It really is remarkable and one that, despite its tragic moments, often gives struggling writers some consolation. Cory, this is absolutely so fascinating. I can totally imagine what meeting Bunt Percy and hearing her recollections of Souther literary greats was like. I have always loved Walker Percy, and his role in getting Toole published is indeed a remarkable one. Thanks for sharing these these experiences and photos. I so enjoy them! 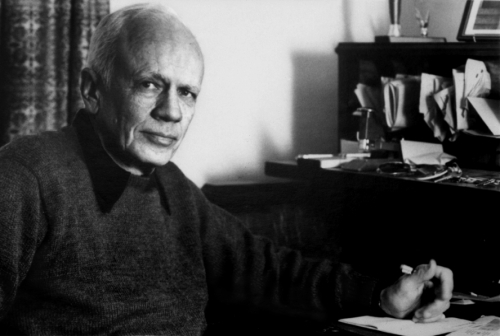 #1) Will a “Walker Percy” be cast in the film? #2) Do you think that Toole consciously named his protagonist after the same family as the Coffee dynasty from New Orleans? Or is that just an Irish coincidence? #3) The “Moviegoer” had a genesis almost (but not quite) as interesting as “Confederacy of Dunces” but my recollection has it being primarily conceived and executed while the Percy family was living in New Orleans proper. Interesting food for thought in a comparison of his novels. Yes. I have read the script and Percy is the quiet hero of the story. His part is one of three leads. Thelma and JKT being the other two. The actor who is interested in playing Walker is a long time fan of Percy’s works. I am not permitted to say more about that casting. Although I can say when I heard his name my jaw dropped and I think I yelled out “Holy Shi*” while in line at the grocery store. It is more likely that Toole got the Reilly name from the neighbor of his highschool friend, Cary Laird. Toole and Laird use to sit in the Laird home bathroom, their ears pressed up to a vent, listening to Irene Reilly curse up a storm next door. They were colorful neighbors who owned a corner store in Uptown. Laird and Toole also had many adventures exploring the neighborhoods of New Orleans and meeting the real life characters he later placed in his novel. I am not totally familiar with the gensis of The Moviegoer, but you bring up an interesting point. I do know that Toole read it and had a copy of it on his bookshelf at the time of his death. Thanks for sharing!